does anyone know where to get the 5th decoration piece? The event only list 4 out of 5 items. I've got nearly all the things, most of which with duplicates of at least like 4 or 5 of each. No Pirate Bandana, King Candy, Hot Chocolate, or Deep Bamboo Hat though. But, I have to say... the Santa Hat looks extremely stupid for Maehwa. Rather than just wearing it like a normal human being like everyone else they decided to have a pony tail sticking out just the right side of her head (wtf?). I'll also note that the white part is black during the snow, which seems like an oversight they probably should have noticed... though I guess hair does the same thing, which should probably be looked at as well. I posted this in the Support forums but I also hope you can see it here. A number of us are having the game freeze within 5 minutes of being in a town with Snow. Dual Core and Quad Core processors are having the issue as well. Change in graphics does not fix it. Have same problem. Made the ticket, got answer like "we need to check your internet connection". Facepalm. The game performance has been greatly degradated by the last patch. I can run into Caliphon which is empty and go to the armor dealer, repair and click out before the NPC appears. I haven't seen Santa around in a while. Is it only a certain time he comes around? Have to agree, they did it with tamer too. Though it suits a tamer more. I just wanted a hat, not a new haircut. Dreaming... in a world of Nightmares. Will the Noel Costume be aviable permanently? Because I dont see any date for it to be removed from the Pearlshop? You can DYE your hair with Merv! I kinda like what it offers Just try more detailed color range with it sweetie! I wonder if it was really that necessary to inject previous Halloween items into the Santa's Gifts event....I am getting everything but the ONLY item that should drop easily....the Santa Hat. Lots of Jack-O-Lantern, Strawman Hat and Wolf Nose....things we all got with quests during Halloween. Only male version of the Santa Outfit comes with the actual Santa Hat and can be purchased. Female version has the elk horns and I forgot to mention that I was trying to get one for my ranger... in the end, I farmed Santa (lol) at Velia and dropped 1 hat. Worth saying that, before getting that, I got something like 35 items, including decors, whistles, earrings, tattoos and tons of Halloween items. By the way, advice for people who complained about competition around gifts: switch channel to less populated. I gathered almost all items from the list except the fox mask, but I don't really need so I'm done with event. It took me about 4 hours in total. I just found a channel with the least populated Heidel where none was hunting those boxes even during peak hours. How do you post so fast? are you refreshing your browser like 1000 times? can't answer you rn, refreshing. Winter has arrived in Black Desert! 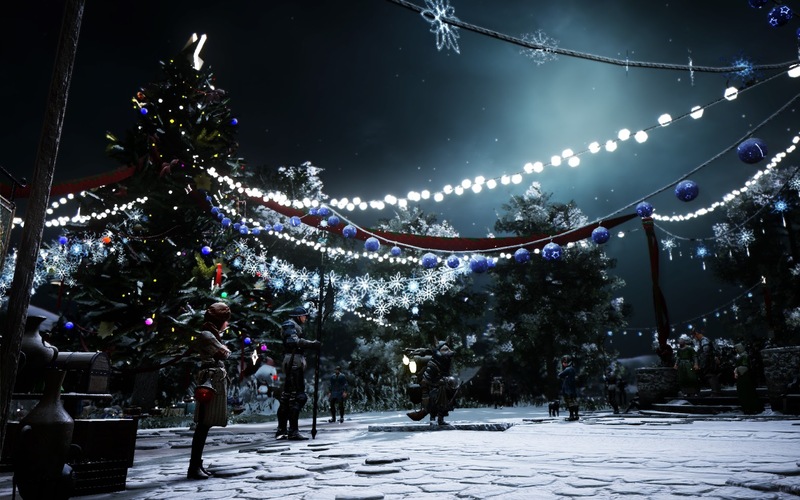 It has begun snowing in the world of Black Desert. Some regions will now have fallen snow and winter themes applied. Login, Channel Select, and game loading screens have had Winter themes added. In-game night times have a new Aurora effect added. Fallen snow effects have been added to some UI/Menu windows, these effects change at random each time the window(s) are opened. Christmas outfits, Furniture, and Decorations have been added! Pearl Shop gifting has temporarily returned for the holiday season. Character must be level 56 or above. You can input the quantity and the character name to receive when purchasing. To check for a gift simply open your mail with the (B) key to find them along with your normal mail. Gifts can only be sent to characters belonging to the same World (NA or EU) and can not be sent to yourself. You can not gift more items to someone than can normally be purchased/obtained. As an example gifting will not allow someone to go over the normal amount of possible inventory slots. While wearing the Zebra Underwear or Zebra Underwear (No Stockings), and entering Dye interface with the combat stance turned on will no longer cause a graphical glitch with the sorceress’ body. Equipping The Thermian Casual Outfit and hiding the hat will no longer cause a graphical glitch. The lobby character selection screen, lobby customization screen, Pearl Shop, in-game customization screen, and Dye UI have been updated to include the newly upgraded backlight and reflection effects. An issue that was causing the horse icon to randomly disappear from the screen when entering the settings menu directly after taking a horse out of the stable has been fixed.